6 steps to start using this strategy in your digital business. We always talk about how the digital market has enabled many people to work with what they love and also work from home. Among the various possibilities of working on the internet, creating digital products is an alternative that draws attention especially from people who are already experts in a specific subject. But in addition to creating a product, you need to promote it and show that you are an authority on the subject you are addressing. There are many marketing strategies available and one of them is online lectures. They are a way to showcase your expertise and deliver valuable material to your potential clients for free. Do you want to know how to become an authority within the subject you address? In this text, we briefly explain what online lectures are, their advantages and how to do them. What is an online lecture? When we talk about online lectures, we are referring to all classes or the development of any subject that can be broadcast in video and live format over the internet. They can address any subject and are usually open so that the audience can send questions that are answered during the broadcast. Online lectures may be long, around two hours, or shorter, straight to the point, merely to introduce a subject that will be more detailed in your online course, for example. The important thing is to offer valuable knowledge to draw people’s attention and thus show that you are a reference on that subject. The main advantage of giving lectures online, as we said before, is to be seen as an authority in the digital market in your area of ​​expertise. Being seen as an authority online in the niche in which you operate is essential to stand out from your competitors in the digital marketplace. When you are starting out and you still aren’t well-known in the market, it is important to make a good impression. If your subject is electrical engineering and you deliver an online lecture about air conditioning, it is very likely that those watching your live broadcast will turn to you to solve issues related to this topic. By explaining in a technical, and at the same time clear and objective manner, the knowledge you want to transfer can be well absorbed and people will realize that what you teach is effective in answering their questions. As a result, whenever they need answers to problems related to the topic you are addressing, you will be the first person they will turn to because people will already know that you can help them. Unlike an in-person lecture, where there’s a physical limitation, online lectures don’t prevent billions of people from watching you from anywhere in the world. In addition, if it is performed on social media, for example, the buttons to share your live stream become your allies when it comes to increasing the number of people reached. In fact, people you never even imagined can have access to your material and become your clients after hearing what you said in your lecture. And do not think that this is an advantage only for those who work in the digital market. If you are a teacher or want to provide a training course to a group of people but cannot be there in person with all of them on a given day and time, online lectures are a great solution to break down this physical barrier. The fact that online lectures are free is a way to captivate your potential clients and show them that you offer complete and quality content without charging anything for it. 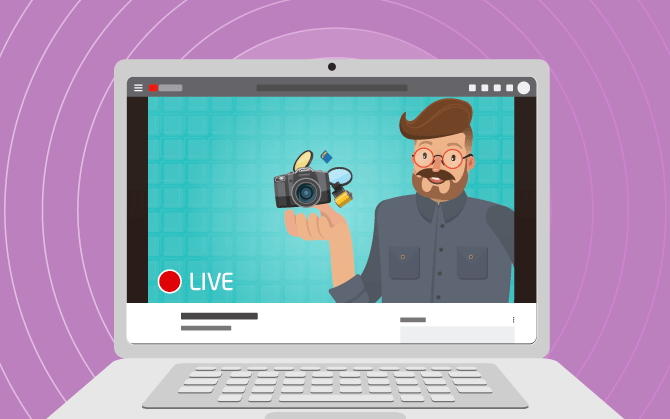 Additionally, live streaming is the perfect moment for people who still have questions about your product to ask questions and by answering them, you can deal with possible objections. If your goal with the lectures is to sell a product, it is important to show all your knowledge within that area. Thus, potential clients will observe the value of your work, which will provide more credibility to your product. Consequently, they will make their purchasing decision more easily when they understand the value of what you are selling. This advantage refers to the speaker and not to the product itself. By giving online lectures, you can develop your communication skills very effectively. This is even more visible for shy people who are afraid to speak in public. Unlike speaking to an audience that is in the same location as you, you won’t see who is watching your broadcast. Thus, explaining a certain subject becomes easier than doing it in front of several unfamiliar faces. The exercise of speaking in front of the camera also helps and improves the expression of ideas and clarity on the subject being addressed. It is possible to obtain feedback when you are giving your online lecture, which allows you to improve certain aspects in the manner in which you explain content. In addition, online lectures can also be a preparation for those who wish to start recording online courses, but that have difficulty in performing well in front of the cameras. Working from anywhere in the world is perhaps one of the advantages that draws the most attention from those who give online lectures. In order to use this strategy, all you need is a camera to record, which can be your computer camera, and a fast internet connection. It is much easier to talk about a certain subject if you are somewhere in which you feel comfortable. In addition, the pleasure of working during the hours and days you choose is very appealing for those who value the quality of life in the workplace. Now that you’ve seen the benefits of delivering online lectures, we will explain the main steps for creating your live broadcast. The first step for an online lecture seems obvious, but it is essential: you need to define a specific topic. We need to point out that the subject selected should be within your domain of knowledge. This is the only way you’ll be able to develop your chosen topic well. If your specialty is math, for example, don’t offer lectures on subjects outside this area. Besides offering poor quality content, people who are watching your lecture may not be interested in topics unrelated to what you set out to talk about, which will cause them to abandon your broadcast. Establish clear goals for your lecture. If you are giving an online lecture to sell a product, it is essential to stay focused on its advantages for those who purchase your product, as well as clarify doubts. In addition, it is important to call the viewers’ attention at the end of your talk leading them to your sales page. On the other hand, if your goal is to educate your audience even before offering a solution for someone to buy, it is important to approach the chosen topic in a general manner and not focus on sales. Thus, people will understand that their goal here is to share knowledge about a specific subject, without having to make a sale at that time. It’s good to always have a script on hand with the main points of your online lecture so you won’t forget anything you need to talk about. It’s quite normal to deviate from the main topic when you leave the broadcast open for questions. This interaction is great of course, but you cannot let the subject deviate to the point where you are unable to talk about everything that you’ve prepared. Therefore, a script becomes indispensable, because if you forget about a particular topic you want to talk about, it is possible to use this tool to get back to the main points of your lecture. But be careful so as not to create a script with all of your lines in your online lecture. Speaking on a live broadcast should be fluid and light without reading a ready-made text because it would create a bad impression with your audience who might think that you don’t master the subject matter. There’s no use in preparing to give a lecture online if you do not have an audience to watch it. Therefore, advertise the broadcast on your social media, by email, create paid campaigns and also post it in groups that have an interest in the topic you are going to address. Use all marketing strategies possible so that people can know beforehand that you will be giving an online lecture. As informal as it may be, an online lecture cannot be held without prior preparation. The recording location, the internet that is working well for the live broadcast, the computer’s configuration, the microphone and the camera that will be used, are of paramount importance. Technical problems do occur, but they need to be avoided at all costs. The internet connection might oscillate, and of course, this is not the responsibility of the speaker, but it is possible to perform tests before the date scheduled for the broadcast. On the other hand, making sure that the microphone and camera are working is your responsibility. The online lecture must be broadcast live, in real time for those who are online on the date and time previously informed to your audience. In order for this to work, you’ll need to rely on platforms that allow live streaming, which can be YouTube or even Facebook. When choosing the platform to broadcast your online lecture, consider the networks your audience uses the most. Thus, it will be easier for them to watch a broadcast on a platform they already know.